Product and Systems Development compiles more than twenty years of research and practice from a value perspective, from vision and marketing to design, manufacturing, delivery, operations, and maintenance. It defines stakeholder value and identifies specific stakeholders in the product and system development process; covers best practices in development; and examines systems engineering, current industry views, and the life cycle of a value stream. Product and Systems Development is an excellent coursebook for senior and graduate students in aerospace, mechanical, civil, electrical, and material engineering, as well as management science and engineering. It is also a useful reference for practicing engineers in a variety of technology-based industries. 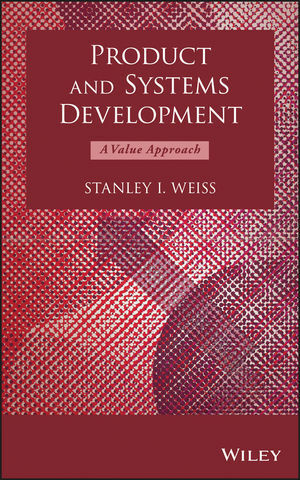 STANLEY I. WEISS, PhD, has served as a Consulting Professor at Stanford University since 2000. He earned his PhD in theoretical and applied mechanics at the University of Illinois and is a graduate of the Advanced Management Program at Harvard Business School. Dr. Weiss developed much of his research and practice in the fields of product design and manufacturing at MIT and Stanford and during thirty years in industry and government. He is a past chairman and current advisory board member at the Rensselaer Polytechnic Institute's Department of Mechanical, Aerospace, and Nuclear Engineering.